GENERAL OVERVIEW: One of the two peaks with the same name and located relatively close to one one another, the southern Mt. 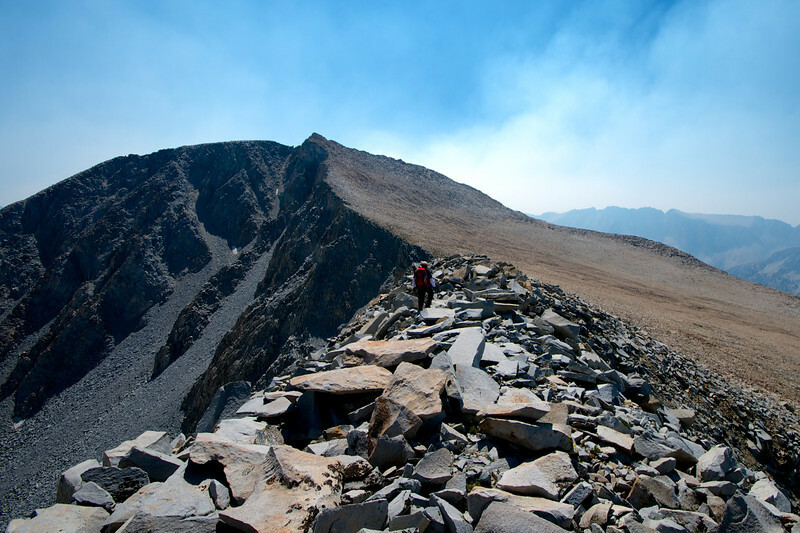 Morgan (also known as the Inyo Morgan after its county) is the 31st highest summit in California. It is also one of the most prominent mountains in the Sierra, coming in 8th overall. Mt. 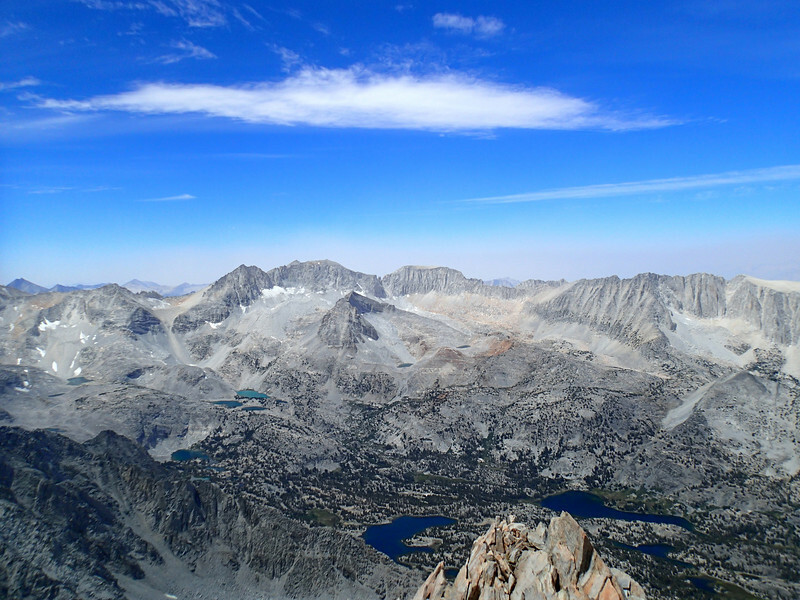 Morgan dominates the Rock Creek/Little Lakes Valley area, with outstanding summit views in all directions. CLASS/DIFFICULTY: The main route from Francis Lake and following the Northwest Ridge is Class 1-2. A traverse from Little Lakes Peak to the south is Class 3-4. A traverse from Wheeler Peak or Broken Finger Peak by way of Twelve Flags Peak (all to the east) is exposed Class 3-4. The Northwest Ridge can be also be reached from Little Lakes Valley via a tedious Class 2 slog. LOCATION: John Muir Wilderness in Inyo National Forest. View Mt. Morgan on HST Map. ROUTE DESCRIPTION: The main route starts at Tamarack Lakes Trailhead near the shores of Rock Creek Lake (elev. 9750ft). From there, a well-maintained trail is followed until the signed junction with a lateral to Francis Lake. The trail terminates at Francis Lake, after which a cross-country hike begins heading generally in a WSW direction to gain the ridge. The section has some steep slopes and is mostly sand and boulders, but stays class 1 until reaching a gap in the Northwest Ridge proper at around 12,000 ft. From this point, the ridge is followed straight up in a southerly direction, dropping on the northern side where necessary to avoid difficulties exceeding class 2. 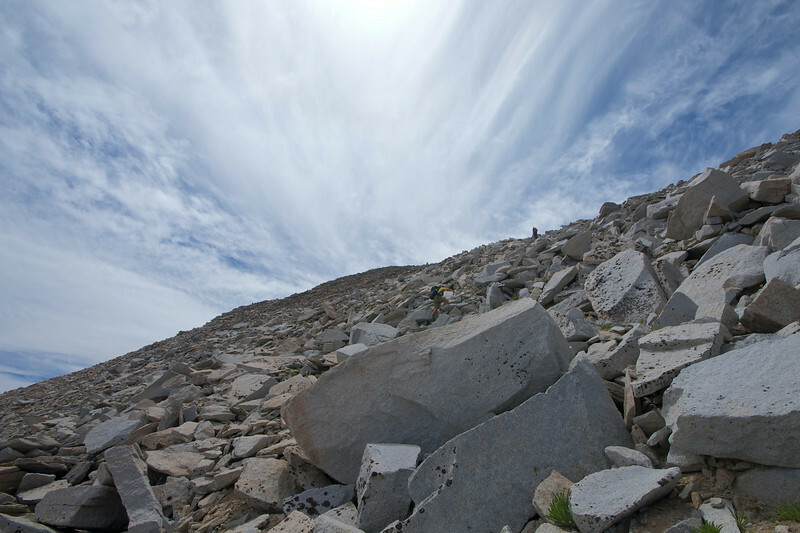 After reaching a plateau at around 13,000 ft, the last part of the route is a talus scramble that can be done directly up the north-facing slope or by staying high on the ridge. Route statistics: 5.6 miles, 4287 ft elevation gain. A route coming from the east involves going over Twelve Flags Peak (13,470 ft). The ridge connecting this peak to the plateau at the base of Mt. Morgan's summit is a knife-edge with significant exposure in places. It is mostly class 2-3, but the narrowness, exposure and looseness of some sections warrant serious attention. Gaining the ridge above Francis Lake. The gap is visible in the center of the photo, with the Northwest Ridge heading up and to the left from it. View from the gap. The Northwest Ridge continues to the left. Little Lakes Valley and the Mt. Abbot group straight ahead. Final talus scramble to the top. The summit is the highest bump in the center of the photo. View from summit. From left to right: Hourglass Couloir, Mt. Dade, Mt. Abbot, Mt. Mills, Ruby Wall and Peak. Below are Treasure Lakes and Gem Lakes (turquoise), Chickenfoot and Long Lakes (cobalt). Summit of Mt. Morgan from the ridge with Twelve Flags Peak. Last edited by orbitor on Wed Sep 18, 2013 10:25 pm, edited 2 times in total. Eric, sorry, I couldn't figure out how to create a hyperlink to the HST map within the text. Perhaps you can help. Thanks for posting this, Orbitor. Great pics, too. Amazing to see zero snow in the Hourglass. I climbed it in September of 2011 (a high snow year), and there was snow from the cirque almost up to the saddle below Mt. Dade. 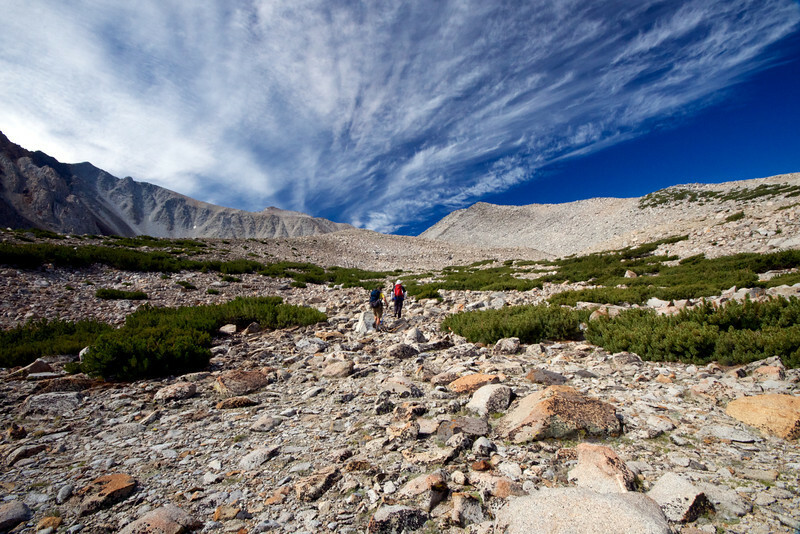 Do you know what the best trail/route in is for the little lakes peak to morgan traverse ? Which direction are you looking to do the traverse in? If starting with Little Lakes Peak, you could come in from Pine Creek toward Morgan Pass and go up the south slope from there (according to SummitPost, that's a class 2 route: https://www.summitpost.org/little-lakes-peak/154669). If starting with Morgan, you can set up a shuttle with one car at the start at Tamarack Lakes and the other at Pine Creek, and thus do a point-to-point. Finally, you can create a long loop from Tamarack, hiking through Little Lakes Valley over Morgan Pass to the class 2 slope and coming down the normal Morgan route.